GINDS is an art project all about sound and listening. A project that explores peripheral sounds. GINDS listens to what is happening on the other side of the border. Urban borders are defined. This gives rise to two areas: the area inside the border, which is ours, and the area outside the border, which is theirs. 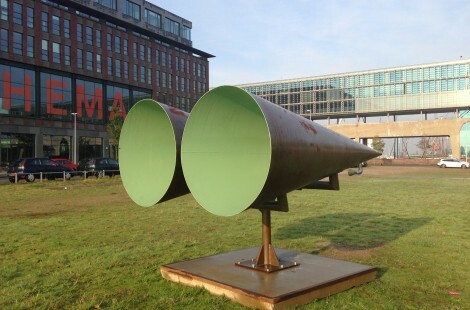 You can stand between the two giant amplifying horns and listen to what is going on 100 metres away – across the border. The locations have been selected for their auditory qualities. What you can hear and see does not correspond to where you are.